I am a great believer in the oral storytelling tradition. As a child who reached schoolgoing age before television arrived on our shores, I grew up with stories – either those read to me by my mom before an afternoon nap, or told to us by my dad when he used to bath me and my brother. Even our play was often one long elaborate role-play based on some story we had heard, made up or suitably embellished. Luckily, by the time TV did arrive, this tradition was so ingrained in us that we continued to play the same sort of games, just incorporating the new ideas we had learned from the few TV shows we had in those days. So it’s not surprising to find that as I grow older, I remain a fan of the oral tradition. There are few things that make me feel more at peace with the world than a raucous re-telling of some hackneyed story of past escapades together with either Paul or Bronwyn – usually with each of us finishing the other’s sentences and playing alternately the straight man or the comic relief. The story of the disastrous dinner table delivery mid-meal. The account of visiting Crazy Steve at his peculiar house in Oshkosh, Wisconsin. The story of the camping trip on Robberg and foraging for water. The tale of the “serpent” in the Chilean outhouse. Or Paul’s cataclysmic housewarming party when he forgot where he lived. Scarily, I could carry on! The point is that after the first couple of re-tellings, the story it is no longer really about the imparting of information – everybody in the room has heard the story a dozen times, and most of us were there when it happened. It’s more about creating and then reinforcing a bond between people and harks back to our ancestors sitting huddled around a fire after a hard day’s hunting, recounting tales of the Big Woolly Mammoth That Got Away. When I was living in South Africa and Nick was over here in London, I had the good fortune of living two doors away from my dear friend Bronwyn. We slipped easily into a routine (including Monday night supper club and Whose Line is it Anyway!) and for 18 months, Bron and her boyfriend and I were inseperable. One Friday night we decided to go to dinner at an Italian place that had recently opened in our suburb, and about which our friends had been raving. Little did we know that the evening was about to sail effortlessly into our oral tradition! We had booked at table at 20h00, and when we got there, we were told to wait as the table was not ready. This is usually mildly annoying, but it was particularly so in a restaurant that has no bar or waiting area to speak of! We kind of had to loiter between tables of other diners who looked us suspiciously up and down while we eyed up their food. Not an auspicious start. But eventually we were led to a table. A smoking table. Which we had specifically asked not to get. But hey, easy mistake to make, so we called over the waiter and explained the situation. After some hemming and hawing, we were led to a non-smoking table in the next room. A table laid with nothing other than a tablecloth, that (by the look of it) had also been used by the previous diners. But hey – it’s a neighbourhood bistro, so we didn’t complain. Next, a flustered waiter appeared and gave us a wine list and menu before bustling off in search of cutlery. This then seemed to occupy him so fully that he neglected to return to take our order. So we snagged another waiter, who seemed amazed that we had not been served yet and took our order. Result! Within a few minutes, we had a bottle of wine on the table. Unopened. And without glasses. Erm, well, yes. By this time we were starting to see the absurdity of the situation and were giggling our way through what was proving to be an evening of inexplicable service. Eventually our original waiter returned to take out food order, so we seized the chance and asked him nicely to open our wine for us. Which he did… and then walked off, leaving us glasslessly staring at our bottle of wine. We then got even more demanding and called over another waiter to suggest that he might bring us some glasses – and the look he gave us indicated that we had in a few short minutes acquired a reputation as “the difficut table”! But after scanning the table in confusion for a minute or two, he had to agree that we had nothing to drink out of except the bottle. So off he went… and minutes later our waiter returned with two glasses! By this time the three of us were falling about in hopeless hysterics – it was a textbook Fawlty Towers meal. So when we ordered our meal, we were already expecting the worst – or at least some new and unforeseen weirdness. But what arrived was, quite simply, gorgeous. Bron’s other half had a piece of beef fillet that had been done to medium-rare, melt-in-the mouth perfection; Bron had a pasta dish that I now can’t recall but that she loved. And I got the most delicious pasta sauce that I had ever tasted. Smoky bacon, earthy chicken livers and a creamy sherry sauce; it was utter perfection and I ate as slowly as I could before mopping up the last morsel of this wonderful sauce. I swooned. Bron swooned when she had a taste. And every time we recounted our eclectic experiences that evening to friends later, we referred to that magical pasta sauce as “The best pasta sauce in the world”. I hope you have enjoyed sitting around my campfire, and I hope you love this sauce as much as I do. Boil the pasta in salted water according to package instructions, until al dente. Chop the onion and crush the garlic. Heat a little EVOO in a large pan and sautee the onion and garlic until the onion starts to soften. Meanwhile, chop the bacon rashers into 1cm strips (or you can buy pre-chopped bacon bits) and add to the pan. Fry until cooked. Using a slotted spoon, remove the onions, garlic and bacon from the pan and keep warm, but reserve the cooking fat. Add the chicken livers to the pan (you may want to chop each liver into 3-4 smaller pieces). Cook until just done but still pink in the middle – watch them carefully as there is nothing worse than an overcooked rubbery chicken liver! Add the onions and bacon back to the pan, remove from heat and stir in the flour to absorb the cooking fat (use more flour if you have a lot of fat). Stir in the milk, making sure you get rid of any floury lumps, then add the cream and sherry and return the pan to the heat, stirring continuously to keep the sauce smooth (add more milk/cream as needed). Season with sage, oregano, black pepper and salt as desired. Drain the cooked pasta and return it to its pot, then add the sauce to the pot and stir through. Serve in heated bowls, garnished with chives. OPTIONAL: you can also add chopped mushrooms when you cook the bacon; and you could spice things up by adding paprika or some dried chile flakes when you cook the livers. This post is my submission to this month’s Waiter, There’s Something in My… event hosted by Andrew. The theme this month is sauces and you have until the end of 31 July to get your entires in! 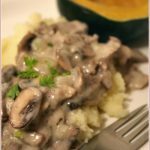 I seriously love chicken livers, and this sauce sounds great and I am definitely trying this! This recipe looks absolutely gorgeous, worth breaking my diet for I think! That sauce looks utterly gorgeous. I don’t know why, but I’d never thought of putting liver in a pasta sauce. I love liver and I love pasta so I will definitely be making this… or maybe I can convince Goon to try making it… he’s been improving a lot recently. Yes, that looks and sounds stunning. I’ll try it soon. You had me with the photograph! Love the story too!! And how absolutely brilliant that the food was good after all that nonsense!! P.S. I neeeeeeeeeed some of that sauce…. 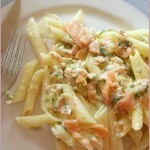 Oh, I love the look of that rich creamy sauce and the way it clings to the pasta! Waiter, it is time to get Saucy! What a fantastic story teller. Thanks for sharing not only a great story that still has me chuckling over, but the scrumptous pasta too. 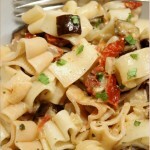 Hopefully you share some of your great pastas over at Presto Pasta Night. heehee.. I loved this post. Loved your post and tried the dish tonight. Rasher of bacon? Well, I managed without knowing exactly the amounts to use, but I am a “by the seat of my pants” cook anyway. Liked it, but next time I will cut the livers up a bit smaller and perhaps use a bit less of them. My bacon was non too lean either but the way they package bacon these days, you can hardly tell what you’re buying, right? Thanks for your post. It was a lovely read. Four years later and this recipe keeps giving good results. Just finished it for lunch. It’ll be a part of a regular rotation anytime I get a hankering for chicken livers. Thanks for posting. This story had me laughing aloud. Making this recipe tonight and I’m sure we are going to love it!